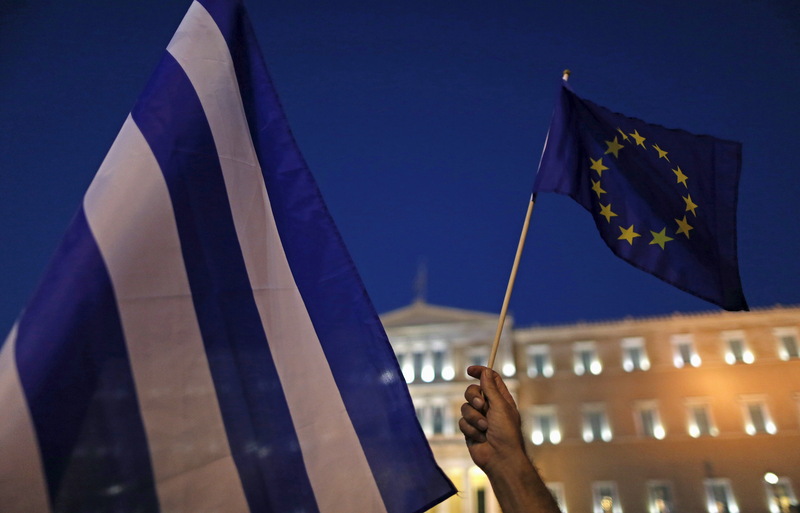 Protesters hold European Union and Greek flags during a Pro-Euro rally in front of the parliament building in Athens, Greece, July 9, 2015. Greek Prime Minister Alexis Tsipras raced on Thursday to shore up political support for a tough package of tax hikes and pension reforms due within hours if Athens is to win a new aid lifeline from creditors and avoid crashing out of the euro. Greece’s central bank is working on a plan to help the country’s banks offload up to 42 billion euros in bad debts, according to people familiar with the discussions. Lenders have agreed with the European Central Bank to shrink bad loans to 64.6 billion euros by the end of 2019. Non-performing exposures stood at 88.6 billion euros, or 47.6 percent of banks’ overall loan book, at the end of June. Under the Bank of Greece’s plan, lenders would transfer about half of their deferred tax claims to a special purpose vehicle, according to a Reuters report on Nov. 13. The vehicle will then sell bonds and use the proceeds to buy up bad loans from the banks.